I hope your weekend was beautiful and peaceful and I wish you all the best for the upcoming week. It's already October but surprisingly the weather is still so warm that my brain can't process the information that fall is here, my thoughts are still in a summer vibe! 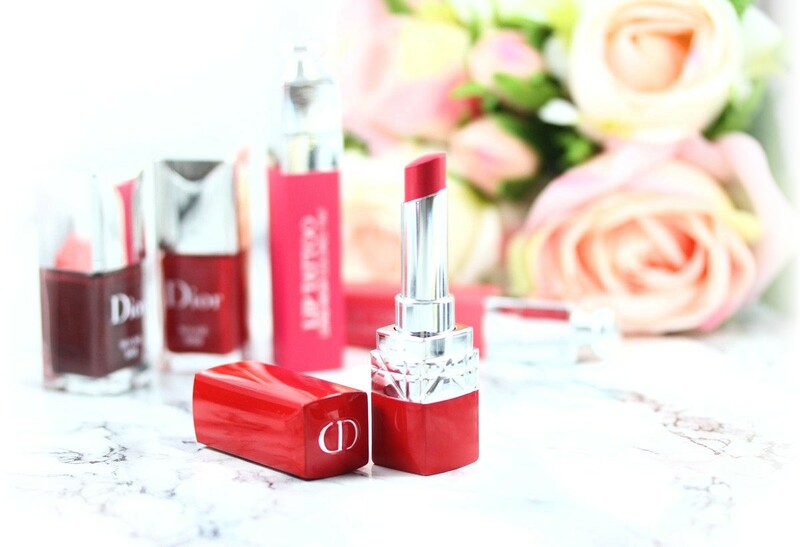 Anyway, today I wanted to show you some new lip products from Dior. 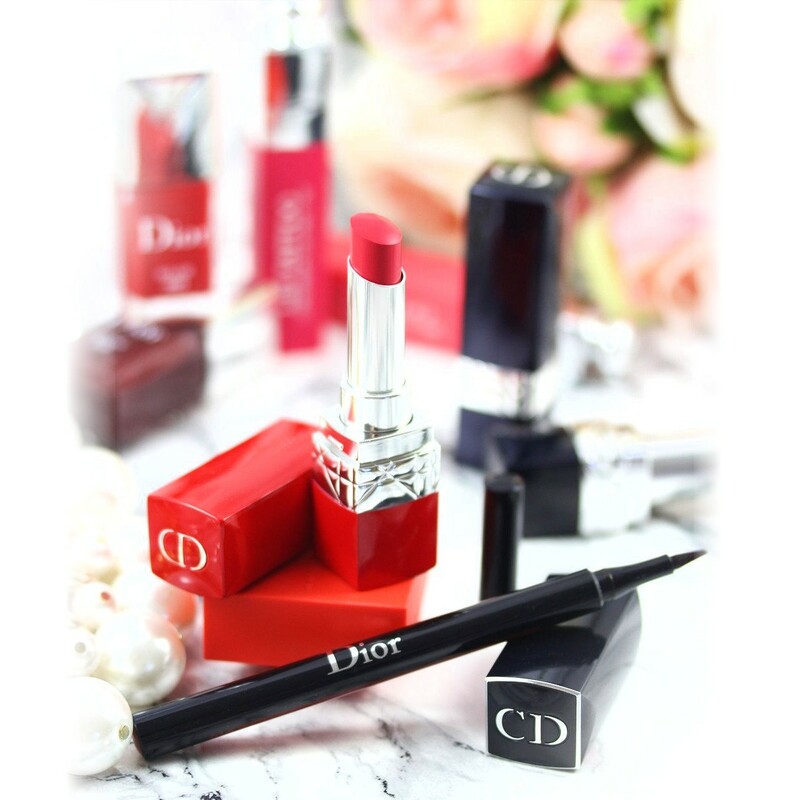 Dior has launched a new line of lipsticks, the Ultra Rouge. They're supposed to be ultra pigmented, weightless, hydrating and last 12h. Doesn't that sound amazing? Also new are the Ink lip liners. Ink lip products are always something that makes me terribly excited as I love long lasting and lightweight products. 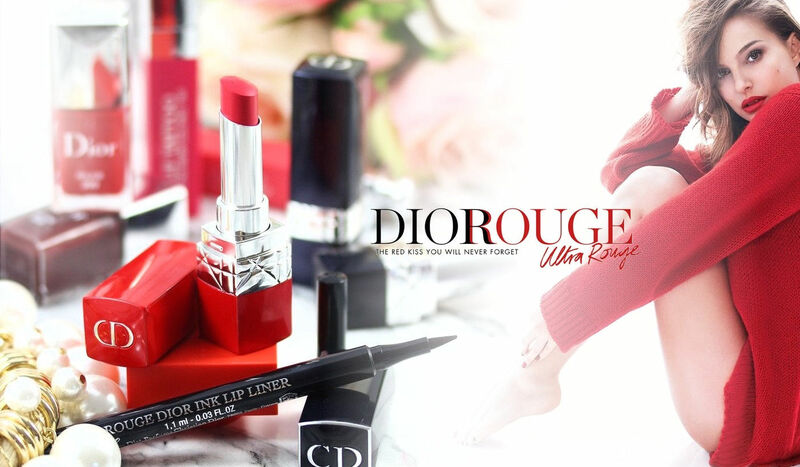 Ultra Rouge offers a lightweight, ultra-comfortable formula that feels hydrating and that can even cover dry patches. So if you're someone who doesn't like wearing lipstick because you always struggle with dry lips, this new line should be your new friend. Moreoever they're ultra pigmented. I was expecting sheerer textures considering the ligthweight and hydrating description but they're on the contrary super pigmented. The color is really saturated and deep. Finish is semi-satin and luminous. It's creamy but not glossy, it's more velvety but with a pretty sheen. Oh and I forgot to mention the packaging....!! 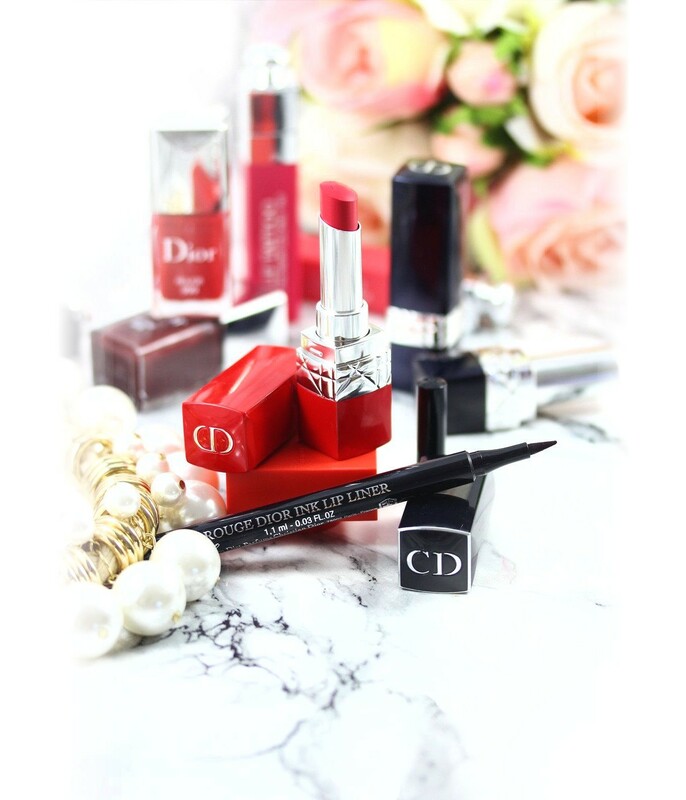 The lipstick is housed in a beautiful glossy red case that looks really elegant. 770 Ultra Love is a deep medium pinky red with a creamy formula and a satin finish or rather satin with a sheen finish if that makes sense. Pigmentation was opaque in 1 layer, a second layer adds depth. 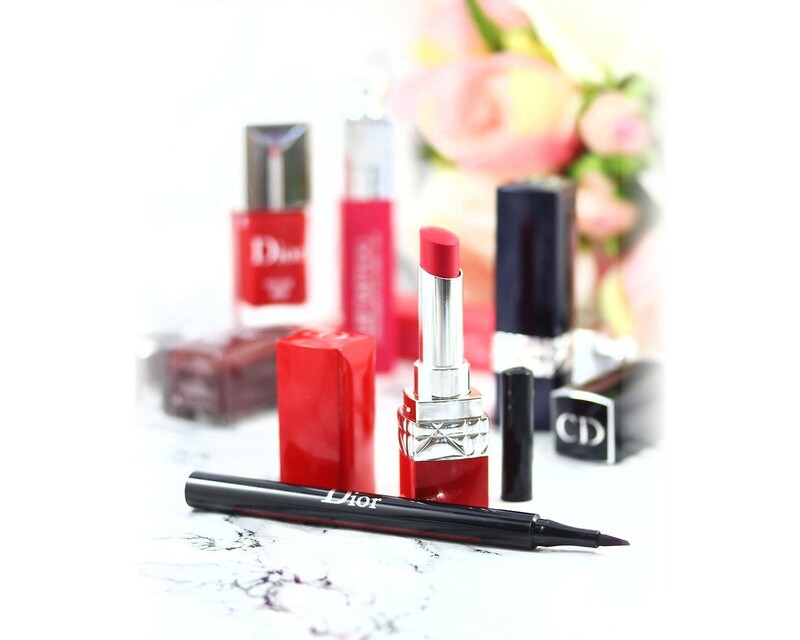 Application is easy and even and it feels creamy and moisturizing on the lips. I have the impression it smoothes out my natural lip lines and makes them look fuller. It stays about 5-6h on my lips and leaves a stain behind (although you can't really see the stain in my arm swatches below). Overall this new formula is really beautiful in terms of finish (the velvety but luminous finish looks super elegant) and in terms of wear. It's really comfortable and I was actually impressed how long it stays on the lips. I will need to check other colors (Ultra Spice and Ultra Lust). 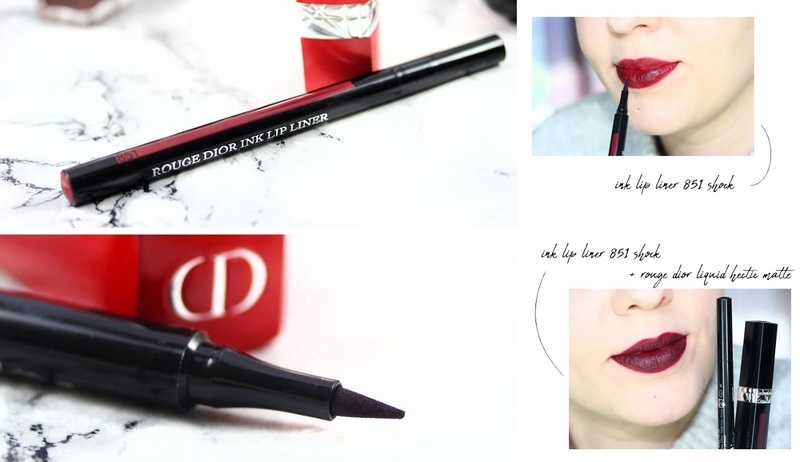 Rouge Dior Ink Lip Liner is a water-based formulated lipstick in a felt-pen. They have a pigmented ink formula that stains the skin. The color lasts for hours and hours on the lips. In terms of fomula and how they look on the lips (at least the color I have), they remind me of some water-based lip tints that you can find in some Korean brands. The uniqueness of them lies in the felt-tip applicator. I had never seen a lip tint coming with such a precise applicator. I find the idea quite brilliant actually. 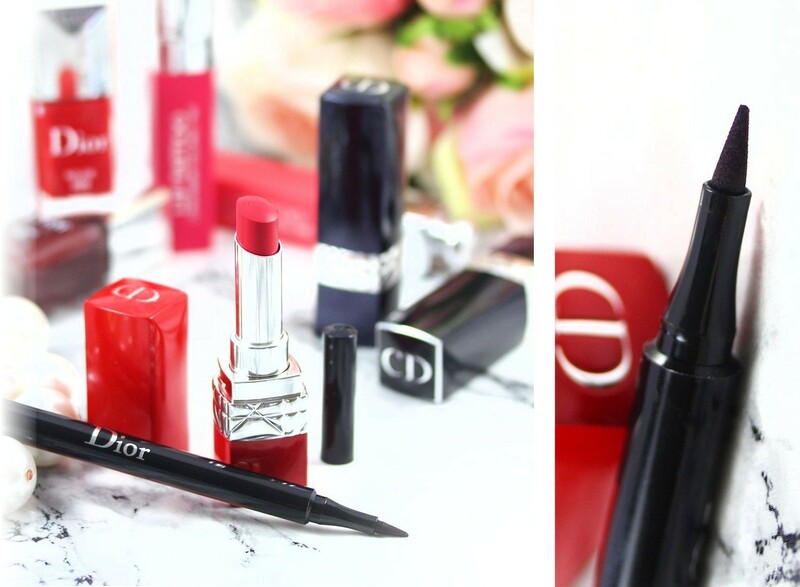 This type of formulation is perfect to last on the lips forever (or almost forever ;D) and therefore using it as a lip liner to define the lips and help the lipstick lasts longer is a really clever idea in my opinion! 851 Shock is a darker color and works great to line the lips. When you apply it all over the lips it's a bit patchy if your lips are dry. My guess is that this is due to the darker color so I would be curious to try a lighter or brighter shade to check this point. Nevertheless I still find 851 Shock pretty impressive. 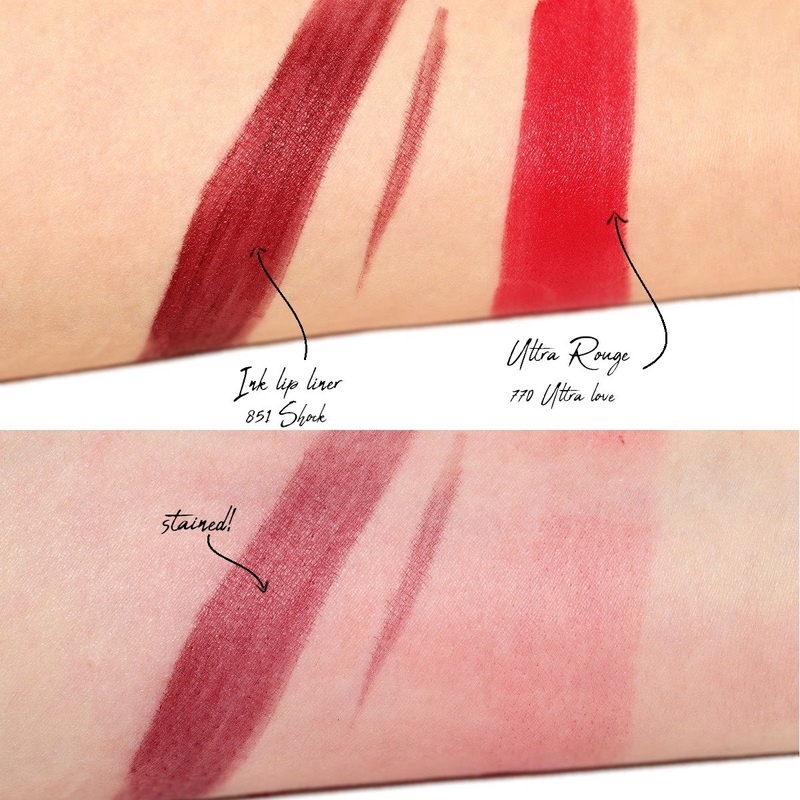 On the swatches below you can see it on its own all over the lips on the upper picture and in combination with Rouge Dior Liquid in Hectic Matte (the ink lip liner all over the lips and then hectic matte on top) in the lower picture. It deepened Hectic Matte and made it last so long! At the end of the day I still had it on and it was still looking good. I was super impressed! It was actually difficult to remove it as the Ink Lip Liner stained the lips. Moreover the combo made my lips super smooth, it's hard to explain but without the lip liner Hectic Matte alone doesn't look that smooth. With this combo I really like how healthy my lips look (full, moisturized and not dry at all), it's actually the first time that I have a dark lip that look that even and beautiful. This is definitely my new favorite fall combo for sure! And there is something elegant about dark lips, I'm super happy to finally have a combo that I love wearing with such a color! In a few words, what I like about this ink lip liner is that it really helped define my lips and increased the longevity and lasting power of my lipstick ++++. I wouldn't wear this particular color alone as it can enhance dry patches or look a bit patchy but as a base for a lipstick, I find it really interesting and worth it. I would be curious to see how brighter or lighter colors would look on their own.